If you’ve started buying a few stocks, you will probably be interested in diversifying your portfolio between more than one sector. This sounds easy, but it can be very challenging finding stocks from a wide range of sources that fit what you’re looking for. Thankfully, our Quotes Tool has all the information you need to get started. Please note that this guide requires the use of the old version of our quotes page. You can filter between major US or Canadian sectors by default, but once you view any specific sector, you can also see stocks from other countries (like the UK). 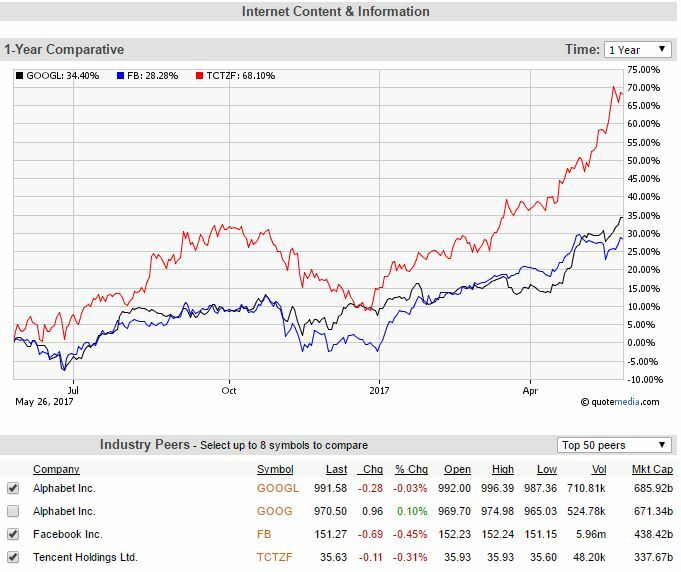 Once you click on a sector, a graph will automatically appear showing the performance of the top 3 companies in this sector (by market capitalization), but you can have up to 8 different companies charted against each other at a time. The “industry peers” are listed below the chart. By default, the top 50 will appear, but you can load as many as you like. Clicking the symbol on the list will give a detailed quote for that symbol, and international companies are included. This can be a great tool to find stocks you might not have thought of, or just a great way to quickly compare industry leaders when you’re looking to diversify your portfolio. 1 of 3) Where can you find the "Sectors" tab? 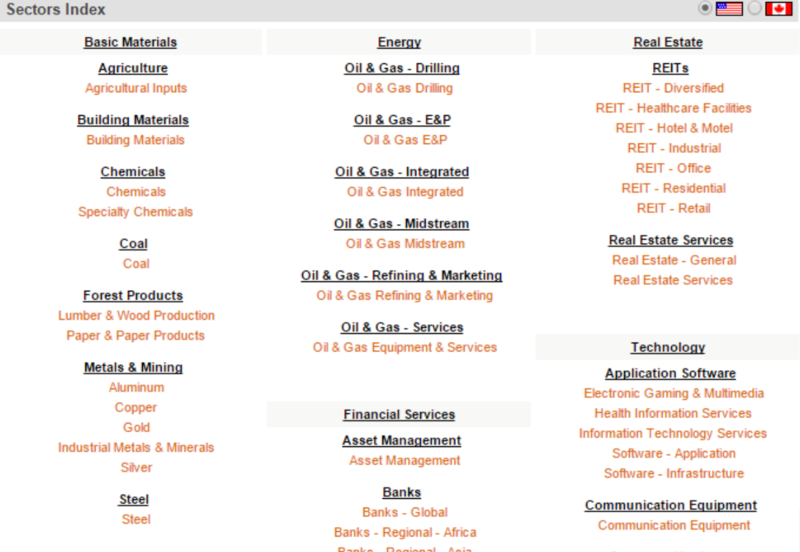 2 of 3) Which of the following do not appear in the Sectors listing? 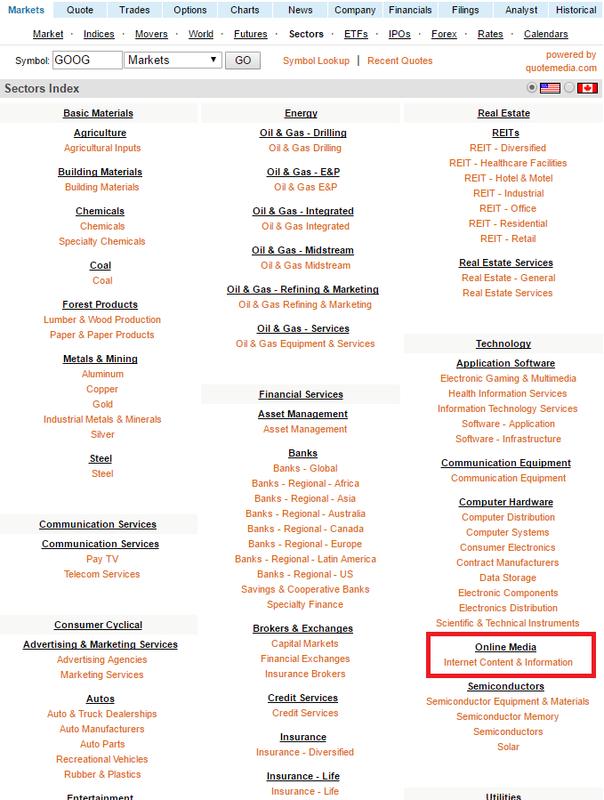 3 of 3) How many industry peers can you see in a list at once?